OCLA Founder/President Denise McCain-Tharnstrom was invited for the second year in a row to present at the annual 40 to None Conference. Held on October 2-4th, 2017, in Philadelphia, this conference focuses on ending homelessness among LGBT and other youth. 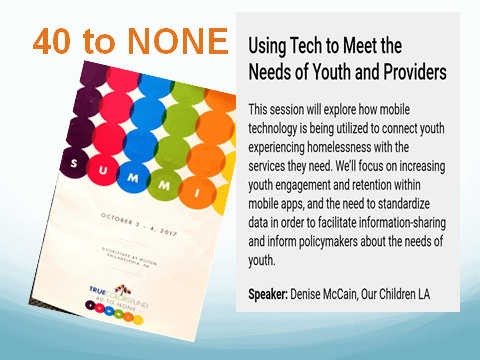 This year her talk focused on the power of mobile applications like WIN to serve not only youth and adults experiencing homelessness (or severe resource insecurity) but service providers and communities seeking to combat homelessness as well. In today’s world, no one locates the services they need using a public phone booth! Everyone uses a cell phone- and homeless and severely resource-insecure individuals are no different. After all, the government provides free cell phones to extremely low/no income folks and even without a cell plan, free Wi-Fi is available in libraries and coffee shops across all cities. With 77% of adults owning a smart phone and virtually everyone regularly accessing a computer, a well-developed mobile directory service makes good sense. Launched in 2015 Our Children LA’s WIN (What I Need) mobile app leverages people’s trust in technology and empowers folks dealing with tough times to find the services they need. Developed with the input of dozens of Los Angeles youth experiencing homelessness, the easy to use WIN app’s look, feel, contents, name and the logo reflect user recommendations. Today WIN connects youth and adults to over 1800 programs in 12 categories of need ranging from essentials such as food, shelter, showers, laundry and haircuts to education and job skills building needed to regain a dignified place in the community. WIN is currently being used in Los Angeles but can easily be brought to other communities. Dr. McCain announced that WIN is not only getting “a facelift” but that it soon will offer many many new features. WIN’s new release in 2018 will simplify access to supportive services such as shelter beds available, push community & provider announcements to users, and offer 24/7 call lines to users in crisis or who simply want to chat with someone. The new and improved WIN will also offer support for providers and communities with the collection of smart data that maintains strict user privacy while documenting service gaps and other regional needs. She also discussed OCLA’s promotion of a national dialogue around best practices and the need to develop common data metrics. Homelessness and severe resource insecurity are among the thorniest challenges facing many communities. WIN’s mobile technology empowers users and their communities to connect to different systems and work together more efficiently to protect youth, families and adults in need. The challenge ahead is to get government, philanthropy and others to understand the important role mobile technology can play in empowering folks in need to reach out and access the services available to help them avoid or leave homelessness. Antelope Valley’s Only Homeless Shelter Closed.